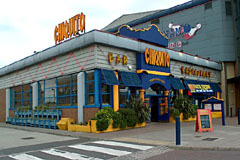 What does the name Chiquito conjure up for you? Is it the thought of sizzling Fajitas, the original, melon or strawberry Margaritas? Or the tangy chilli peppers or the Mexican music? Or perhaps its thoughts of the wild River Chiquito in the community of Estancia in North Eastern El Salvador, or walking the Chiquito trail in Orange County, Southern California, or it may be the Aztec people from whom the word Chiquito is borrowed and means �very small�. Of course �very small� would be the wrong words to describe the portions that one receives at Chiquito � indeed it is very much the opposite. You don�t have to eat. At Chiquito you�re more than welcome to simply pop in for a drink � beers, wines and spirits as well as an awesome selection of cocktails. And you can�t go wrong if you decide on a Margarita, the drink that made Chiquito famous. They come in three sizes � large, very large and call me a cab! And of course our happy hour is a Mextastic time to visit � You can also take advantage of the Chiquito great value lunch offer � all of our restaurants regularly offer either a great lunch menu or a hot and cold buffet selection to �eat as much as you want�. The selection changes every day so you are always in for a mouthwatering surprise! We are open 7 days a week for lunch, lazy afternoons and lively evenings, so whether you’re out shopping, meeting friends after work or planning a party it’s the only place to be! Open every day Mon-Sat noon-11pm, Sun noon-10.30pm. All major credit cards accepted. Optional 10% service charge for parties of 6 adults or more. And if you�ve still got room try one of the many tempting and delicious desserts! Take a look at our Mextastic menu for a full list of dishes.